Just after sunset this week, look for a string of bright objects in evening twilight: planets Mercury and Saturn, and first magnitude stars Spica and Regulus. Look closely at the southwestern horizon this week, and you’ll see two planets and two bright stars. Mercury is the closest planet to the sun, and never strays very far away from the sun in our sky. This is the farthest Mercury will get from the sun this year, so is a good opportunity to catch the elusive planet. It takes a sharp eye to spot Mercury’s tiny speck of light in the evening twilight; binoculars can be a great help here. Sweep above and to the left of where the sun has just set. 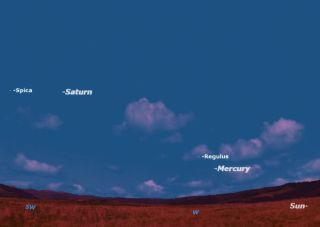 The sky map for Mercury here shows how the planet will appear in the night sky this week from midnorthern latitudes. At this time of year, observers in the Northern Hemisphere will find the angle that the ecliptic — the path the sun follows across the sky — makes with the horizon very shallow, putting both Mercury and Saturn very low in the sky. Observers in the Southern Hemisphere have a much better time of it, with the ecliptic rising steeply from the horizon. Two bright stars are also visible in the southwest: Regulus just above Mercury and Spica just to the left of Saturn. If you have a medium sized telescope take a look at Porrima, the pretty double star only a degree away from Saturn.